One of the cultural wonders to be found in the fascinating city of Kathmandu in Nepal is Swayambhunath Temple an incredibly photogenic and well designed architectural masterpiece of the Buddhist religion which sits atop a hill offering commanding views of the surrounding Kathmandu Valley. 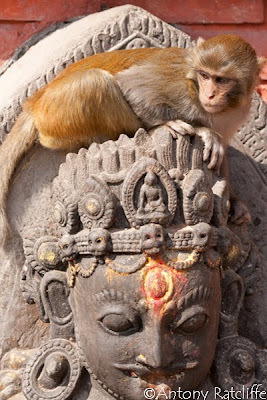 Also known as ‘Monkey Temple’ due to the abundance of monkeys that inhabit the area that in turn beg or rather try to steal from visiting tourists or devotees as they make there weary way up the 365 steps that lead up the hill to the Religious Complex. Swayambhunath Temple is a Buddhist temple situated in such an awe inspiring location it attracts not only religious pilgrims but also tourists by the droves! On a good day when all is clear one can have a lovely view of the mighty Himalayan mountain range with a panorama that stretches a couple of hundred kilometres!! 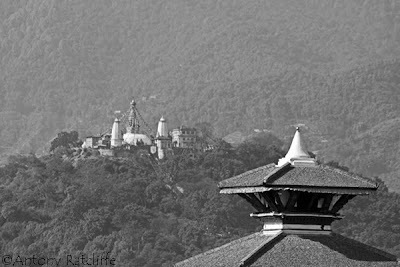 Swayambhunath is a calm place, a place of tranquility away from the sometimes maddening crowd of central Kathmandu. The only sound one hears up there (apart from a faint sound of traffic far below), is the gentle breeze, the tinkling of bells, the turning buddhist prayer wheels and sometimes the chanting monks as they complete their ablutions. Swayambhunath Stupa is the second most important Buddhist pilgrimage site in Nepal after Boudhanath which is another major attraction for Buddhists and non-Buddhists alike who are interested in the history and culture of Kathmandu Valley. Other Sites in the Valley include Pashupatinath where the burning ghats can be found, and where one is likely to see open air cremations there amidst scenes of Hindu devotees giving offerings to the Gods in the temple or on the ghats themselves. Quite a surreal atmosphere and quite reminiscent of Varanasi in India. 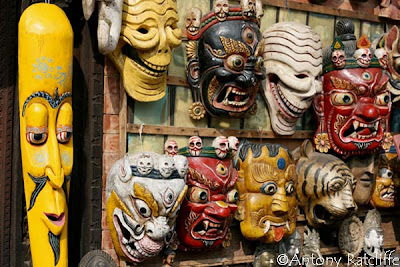 There is also Patan City which is really connected to Kathmandu and remains in the valley along with Bhaktapur. 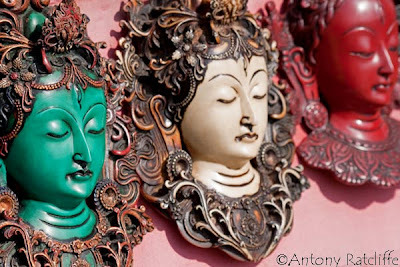 These two places along with Kathmandu are famed for their ancient Newari architecture and Durbar Squares (plaza’s that are full of beautifully scenic Temples). I should also mention even though Swayambhunath is a mainly Buddhist religious structure it also has its fair share of Hindu pilgrims/devotees too. And throughout the many centuries that Swayambhunath has been in existance Hindu Kings of Nepal have also been known to pay homeage here. As for the age of Swayambhunath it is said that it dates back to 5th Century A.D.
Devotees doing circumambulations around the whitewashed dome of Swaymbhunath turning the prayer wheels as they go. 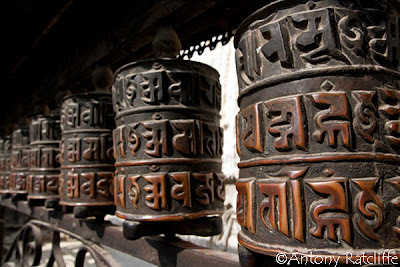 The usual Buddhist way is to walk clockwise around such temples, stupas, chortens or even mani stones. To walk anti-clockwise would relate to the ancient Bon Religion that presided in Tibet before Buddhism took hold there. 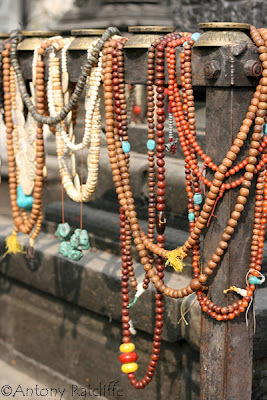 What really interests me about Swayambhunath Temple is all the religious garb and paraphernalia around the hilltop complex, lots of interesting bits and pieces, nik naks if you like. 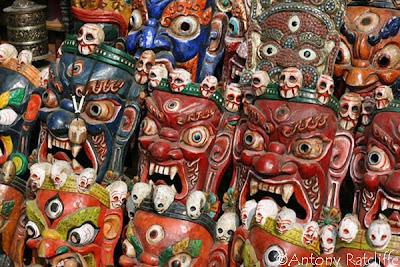 Such as masks ABOVE, wood carved by craftsman and to do with the superstitions that plague religions. 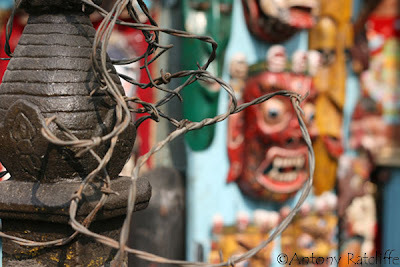 There are stores selling a vast array of demon and devil masks to ward off evil BELOW. 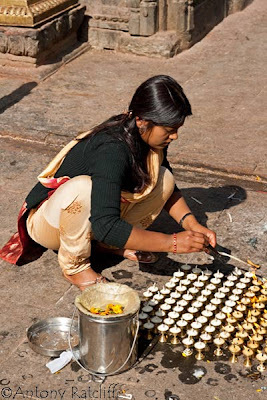 Other things of interest at Swayambhu (Swayambhunath Temple) are the little rituals that devotees and pilgrims partake in. Praying at the temple, worshiping lord Buddha or their Gods if they happen to be Hindu’s, lighting incense and small butter lamps, feeding the monkey’s, bargaining for a good price on the Tibetan Buddhist antiquities or other Nepali souvenirs. It is quite a hive of activity almost everyday. Awesome pictures. Such vivid colours and wonderful angles.